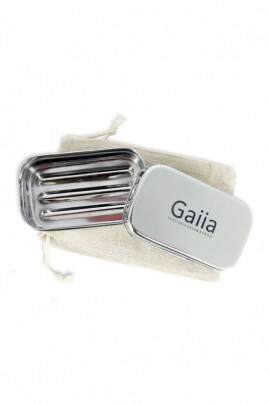 The Gaiia Stainless Steel Travel Soap Box is specially designed to easily carry your soaps cold! Hygienic, it is made of stainless steel, a recyclable and recycled rustproof material. The bottom is shaped drip tray to prevent the soap sticks to the box. It also helps evacuate too much water to keep your soap longer. Thanks to its convenient size, it fits easily in your toilet bag. To protect it even more during your travels, it comes with a nice linen pouch. Resistant, the Gaiia Stainless Steel Travel Soap Box will follow you in all your adventures. A sustainable solution to take with you your surgras and natural soaps.